Big Society means Big Cuts! This position has been developed through discussion and debate over time within RAPAR. We have also been listening carefully to some other voluntary sector organisations who are very concerned about this issue. With all the discussion about the Big Society and what it means for the voluntary sector, we at RAPAR feel it necessary to make this statement about where we stand as a voluntary organisation in Manchester. RAPAR will not take any contracts derived from job losses. RAPAR will be active in our commitment to sustaining safe and appropriate services. RAPAR will take no sub-contracting from the ‘for-profit’ sector. RAPAR will make a rigorous appraisal of prospective partners in projects to ensure that we are not, by proxy, participating in privatisation of the public sector by the back door. 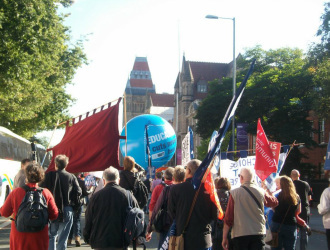 RAPAR attended the inaugural conference for Right To Work, which numbered 900 people and took place in Manchester in Feb 2010. Since this time RAPAR has had a standing delegate to the Right To Work committee. RAPAR remains supportive of the 'right to work' for all. Further, we belive that fighting the prejudice against immigrants to the UK must be incorporated into this debate. The use of immigration as a scapegoat for national woe has much historical precedent, from the Irish immigration in the 19th centruy to Powell's 'Rivers of Blood' speech in 1968. Today, we see the government scapegoating the immigration system for the economic depression, most recently in David Cameron's speech criticising 'state multiculturalism'. It is essential that the immigrant population, and those seeking asylum in this country, are not falsely implicated in the economic situation of this country, and we urge that the debate on economic depression is aimed at the correct sources. As such, RAPAR has now placed itself firmly in the fight against the cuts, and has strong links with Manchester Coalition Against Cuts, and a number of trade unions. If you feel as strongly as we do about safeguarding our services and ensuring that our friends in the public sector see us as allies rather than as opposition waiting in the wings to pick up contracts, please feel free to get in touch with us so we can unite against Big Cuts. Similarly, if you would like to discuss any of the issues mentioned, we'd be more than happy. Please see our contact page. Watchdog examining whether charity set up to lead David Cameron's initiative used funds to pay debts of linked company... Read more here.